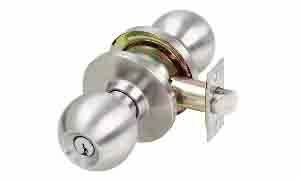 Commercial door locks and hardware. As part of our door security service, we offer new lock installation and repair services to our clients such as magnetic locks, electronic locks, deadbolt locks and more. As a business owner, there are times when lock replacement may seem like the best option for you. However, most security experts agree that replacing a lock may not be necessary. 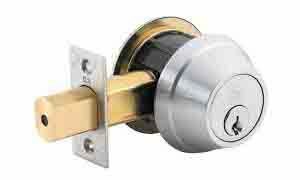 Alternatively, locks can be re-keyed, offering the same security for less money. We understand that purchasing locks can be a complicated decision. If you need help trying to determine which locks will work for your door or even other parts of your business, do not hesitate to give us a call. That way, our Door Repair NYC technicians will be able to properly review your options for a new lock installation with you. How long will the new lock installation take? The time it will take to install your new locks varies for a few reasons. First, it depends on the material your door is made of. For example, it takes much longer to install a lock on a steel door compared to a wooden door. Moreover, the total installation time will vary depending on whether or not the holes required for a new lock installation have already been drilled into your door. If they have not, it would understandably take more time because the necessary insertions must be drilled so that the lock can be properly fitted onto the door. Finally, the installation time might vary depending on the kinds of locks being installed. 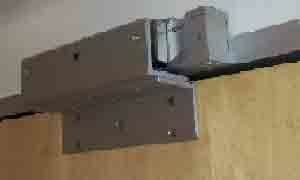 Some business owners request a simple knob spring lock. On the other hand, someone else may prefer to install both a doorknob lock as well as a deadbolt lock in order to make their door very secure. Overall, your new lock installation should take no more than half an hour when done by a professional technician. How do I know which lock to choose for my door? Whether you’ve had a new door installed or your old locks simply aren’t cutting it anymore, you should do some research before purchasing new locks. Once you have an idea of what kind of locks you might want to install, many business owners find it helpful to consult professional locksmiths for further advice and consulting. There are many types of security locks that can be purchased with varying characteristics in regard to the level of security, functionality, and appearance. At Door Repair NYC, we suggest that business owners purchase only ANSI (American National Standards Institute) Grade 1 Locks on their store/office’s exterior doors. Grade 1″ locks are the most durable and, therefore, are most resistant to any type of force applied during a potential break-in. 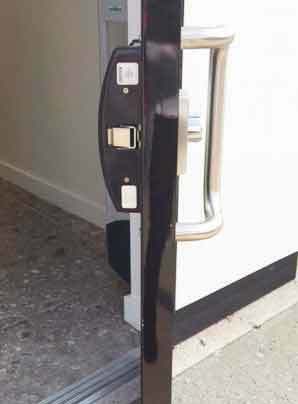 Our qualified locksmiths at Door Repair NYC are extremely knowledgable and skilled at lock installation and repair. We offer a swift and efficient installation process that uses the most effective lock systems available to the public. Furthermore, we offer a variety of lock installation services for commercial properties including the following: exterior/front door locks, bedrooms, bathrooms, and even windows. Additionally, Door Repair NYC offers high-security cylinders and top-notch locks from renowned companies like Medeco, Mul-T-Lock, Assa Abloy, and the like. Our locksmith technicians will install locks throughout your store/office quickly and efficiently, ensuring that your business is secured. Once the process is complete, they will provide you with keys for each designated lock. Lastly, we value our customers and guarantee great service at an affordable price point. Will installing new lock damage my door? 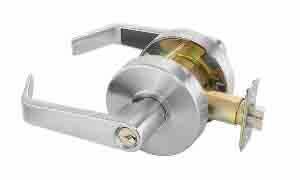 If your new lock installation is carried out by a professional commercial locksmith, then there should be no damage caused to your door. 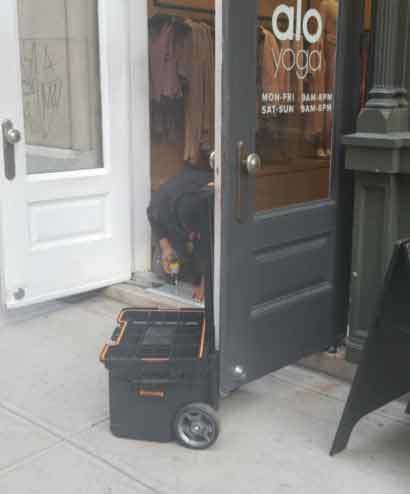 Door Repair NYC’s skilled technicians will have to drill the necessary holes into your door so that they can insert the new lock properly and securely. Nevertheless, we guarantee no damage to your door. It is vital that your new lock installation is carried out by a professional because there are many parts of the process that could lead to a damaged door if the installation is not executed properly. By hiring an unprofessional (and often cheaper) locksmith company, you may end up having to spend thousands for dollars more on a new door installation. The upfront investment is undoubtedly worth it in the long run. Our expertise and high-quality service will save you both time and money down the road. What You Can Try Before Contacting Door Repair NYC? Modern locks have several moving parts and they need to be well-lubricated in order to work well and minimize wear-and-tear. If you are experiencing any trouble turning your key once it is inside a lock, a good first step would be to lubricate it by simply spraying a small amount of oil (or a similar lubricant) into the keyhole. Moving to a new place: The reason we strongly advise buying new locks for your new office/store/business is that copies of keys may have been distributed over the years. A break-in: At the very least, we recommend people replace their keys after a break-in. New York crime statistics show that nearly all of the 40% of burglaries that gain entrance through a door do not involve forced entry. Lost or stolen keys: If a set of keys to the store or office is lost, the first assumption should be that someone who wishes to gain access to your home has the keys. Of course, that is often not the case. Nevertheless, security experts preach preparedness, so if anyone in your family loses a key, you should strongly consider replacing your business’ locks.